The tradition of drama at King’s is a very long one. In the medieval period little is known about what happened in schools in Canterbury, but it may be that rhetoric (part of the trivium) involved speeches more or less dramatically performed. The first direct evidence of school productions comes from the 1560s, when the Cathedral Chapter paid Anthony Rushe (HM 1561-65) for putting on ‘tragedies, comedies and interludes’. Similar references occur from time to time over the next 80 years and the custom of four annual ‘speech days’ seems to have been established. The Restoration saw a revival of drama under George Lovejoy (HM 1665-84), whose Book of Speeches provides a full record of the performances. There are fewer references to drama in the eighteenth century, though Speeches no doubt continued. In 1716, for example, the Chapter paid £5 to John Smith (HM 1713-18) towards ‘his Charge in building of Scaffolds for the Plays Acted by the Scholars, since his coming to be Master’. The first known performance of a Shakespeare play was in 1738. George Gilbert (KS 1809-14) recalls that “the King’s Scholars always bespoke a play, and begged their friends and others to take tickets”. It was probably from the time of George Wallace (HM 1832-59) that Speeches in the Chapter House regularly included a series of dramatic excerpts. The classics featured strongly, but Shakespeare was now ever-present. 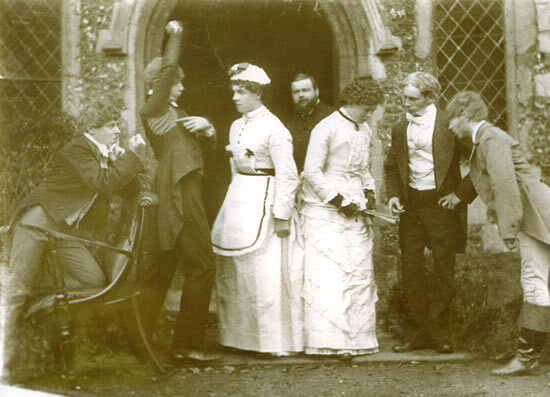 In the 1880s and 1890s, ‘Theatricals’, consisting of a double bill of farces directed by LGH ‘Tar’ Mason, a long-serving member of staff, were a fairly regular feature. These then gave way to Penny Readings or Rag Concerts that sometimes included one act plays. The main dramatic focus was still on Speeches, usually in Latin, French and English. In the twentieth century, the inter-war years saw a revival in drama, not least with the emergence of house plays. Norman Birley (HM 1927-35) was very much interested in the theatre and in his time performances of complete plays were revived, starting with Twelfth Night in 1933. John Shirley (HM 1935-62), another Headmaster with a theatrical bent, built on this tradition. In 1952 King’s Week was inaugurated – a festival of music, drama and the arts at the end of the summer term. Plays have been produced almost every year since then. Over half have been by Shakespeare, with A Midsummer Night’s Dream and Twelfth Night the most performed. ‘Fringe’ plays appeared in the 1960s, and today there are usually at least three plays as well as a dance show. A tradition of Michaelmas Term performances of Gilbert and Sullivan lasted from the 1950s to the 1970s and since then other musicals have been produced at irregular intervals. House plays were also common.